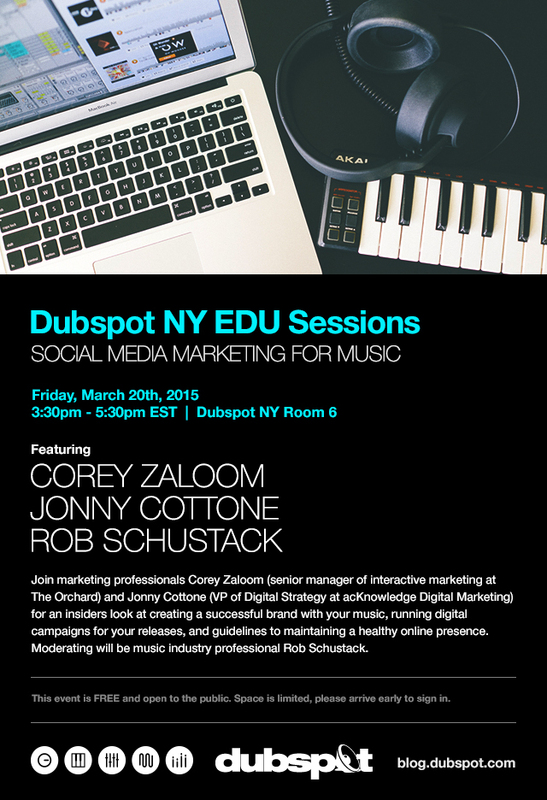 On Friday March 20th, our Dubspot NY EDU Sessions welcomes marketing professionals Corey Zaloom and Jonny Cottone to share their insight on how to create your brand as an artist and maintain a healthy online presence. This free workshop is hosted by special guest Rob Schustack. With so many ways to use social media today, creating your own brand as an artist can be overwhelming for someone who is just starting out in the business as well as seasoned professionals. Join marketing professionals Corey Zaloom (senior manager of interactive marketing at The Orchard) and Jonny Cottone (VP of Digital Strategy at acKnowledge Digital Marketing) for an insiders look at creating a successful brand with your music, running digital campaigns for your releases, and guidelines to maintaining a healthy online presence. Moderating will be music industry professional Rob Schustack, Senior Creative Director of Advertising & Video Games at Primary Wave Music. This event is FREE and open to the public. Space is limited, please arrive early to sign in.